I put together a video tonight that shows the construction of this scrolled floral clock. You can download the pattern below. This is an easy project to cut. The construction is straight forward. 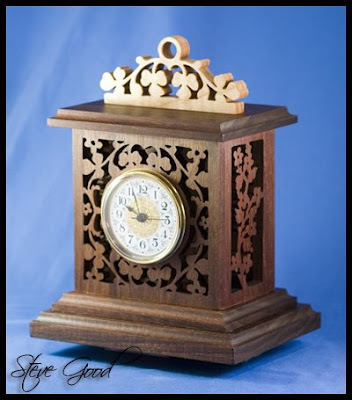 You should be able to make this clock in one afternoon. You will need a 2 3/4" clock insert. Woodcraft opened a new store here in Lexington Ky this month. Today was the Grand Opening. I spent a couple hours wandering around the store. So many toys and so little money. It's nice to have local access to products that I could only purchase online before. Their wood is expensive but I guess that's the price you pays for having it local.